IKOpro Sprayfast FMA is a moisture-curing polyurethane adhesive that enables fast, secure and professional bonding of fleece-backed polymeric roofing membranes to insulation boards and other substrates. It can be applied up to four times faster than standard roller-applied PU adhesives and is suitable for both large-scale fieldwork and detailing. IKOpro Sprayfast FMA is up to four times faster to apply than standard roller applied PU adhesives, thanks to its spray-applied canister system. The product can cover up to one metre square of membrane in as little as 25 seconds, and cures in as little as 60 minutes. 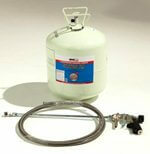 IKOpro Sprayfast FMA can be relied upon to securely bond fleece-backed membranes. The product has passed rigorous and independent testing at BRE for resistance to wind uplift (please refer to the technical data sheet), giving you reassurance that your roof is safe and secure. It also performs in a wide range of temperatures (-30-150°C) and has exceptional long-term ageing properties. In addition to ensuring a secure bond that is resistant to wind uplift, IKOpro Sprayfast FMA ensures a high quality, aesthetically-pleasing finish. It is a non-foaming adhesive, allowing a truly flat lamination of the roofing membrane, without any unnecessary creasing or wrinkling. Furthermore, the spray application ensures even coverage of the adhesive, further promoting a smooth consistent finish. IKOpro Sprayfast FMA has an extremely economical coverage rate, and one canister will easily cover up to 180m². Furthermore, because it is a one-way stick system (the adhesive is only applied to the insulation), only minimal adhesive is required to ensure a strong, long-lasting bond. The 3 metre hose also enables professional, precise application, which also helps to reduce wastage on site. Back pain is a common complaint of many contractors, often caused by bending and stooping to apply hand-poured bead-applied adhesives. 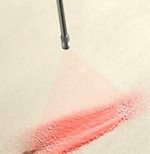 IKOpro Sprayfast FMA can be applied quickly and safely thanks to the 3 metre hose/applicator. It is also simple to carry onsite due to the handles featured on the outer packaging.